Today, the artist Nadia Rusheva would have been 58 years old. All her age-mates are now mature people, most of them grandmothers and grandfathers, but she remained a 17-year-old schoolgirl. Nadia became famous for her special young understanding of classical works of world art, which was expressed in huge numbers of drawings. She attracted a following of similar young people who gathered around her, she had an active social life at school, and she led an active correspondence with friends. According to the Lunar calendar, the New Year, Shagaa, will be met in Tuva with the first rays of the sun on February 14. 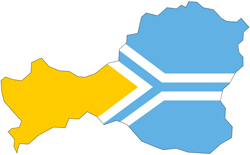 Because this day falls on a Sunday, the free day will be transferred to Monday, February 15, as specified in the law of the republic, “Concerning the holidays of Republic Tuva”. The day of welcoming Shagaa is calculated every year by astrological tables. As the administration of Kamby-lama of Tuva announced, the coming year is the Year of White Metal Tiger. On January 12, the head of Tuva, Sholban Kara-ool started off a new project. The newspaper will now tell you about the contest “Nine Treasures of Tuva” (Tos Ertine) in more detail. Our correspondent’s questions are answered by the adviser of the Chairman of RT, Dina Oyun. Two yurt-towns, “Mongun-Bulak” (Silver water spring) and “Aldyn-Bulak” (Golden water spring) will be built in Tuva this year, which was declared to be the Year of Tourism in the republic. The head of the republic, Sholban Kara-ool, announced this in an interview with local journalists on the eve of New Year. The presentation of the project of the ministry of culture and tourism of RT took place on January 20. 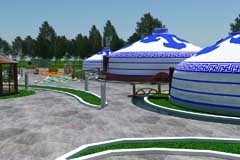 The project involves two yurt complexes intended as stationary campings for travelers. One of the most popular programs of Tuvan television “Bolchag Shagy” (Star Hour) which was first aired on May 17, 1989, received the main prize of the 8th contest of journalist excellence “Agalmatolit Pen”. The Grand-Prix in the form of a pen made of chonar-dash, the soft stone which has became a visiting card of Tuva, was presented to the permanent author of the program, Orlan Damba-Khuurak. In the 20 years of the existence of the show, more than 300 guests were on the show. The very first one was the First Lady of Tuvan theatre, Kara-Kys Munzuk. 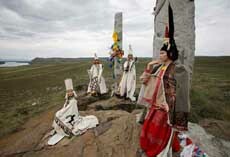 In Tuva, a special project “Nine Treasures” (in Tuvan – “Tos Ertine”) started officially today. All the citizens of the republic, regardless of age or profession can participate. Even all those, who simply love the republic, but live outside its borders, are also invited to participate, whether they live elsewhere in the Russian Federation of altogether in foreign countries. The head of the Republic, Sholban Kara-ool, announced the project “Tos Ertine” at a meeting with representatives of the press, which was dedicated to the Day of the Press, on January 13. 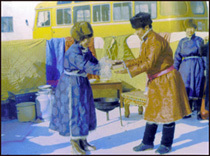 Choduraa Tumat was the first woman to break the traditional Tuvan prohibition on throat singing by women, by founding the women’s folk group “TyvaKyzy”. And now she has given a solo concert in front of Moscow audience in the Cultural Center “Dom”. Tumat founded “TyvaKyzy” and has been the leader of the group for 11 years; she is the solo singer of the group. The Tuvan expedition of the automobile extreme club OffroadMaster from Novosibirsk has finished. This year, 20 groups participated, including those from Ekaterinburg, Krasnoyarsk, Tomsk, and Zheleznogorsk. As the leader of the expedition, Yelena Dmitrieva told the NGS.NOVOSTI, the participants of the trip reached the final point of the route on January 5, when they got to the abandoned fortress of the Uighur kagan. January 12, 2010 is exactly 140 years from the birth of the famous Siberian painter Choros-Gurkin (1870-1937), a student of Ivan Shishkin. From 1921 to 1925, the painter lived and worked in Tuva. Today, his works, including the Tuvan ones, are kept in the museums of Siberia, The State Russian Museum (Sankt-Peterburg), in France and Mongolia. In 1937, as an organizer of uprising activities (to the advantage of Japan) he was sentenced to death by shooting. Grigoriy Choros-Gurkin combined the traditions of realistic painting of the 19th century with symbolistic tendencies. By creating epic paintingsof his country, permeated by ancient mythological associations, he became a powerful influence on the local culture. During the years 1917-1919, Choros-Gurkin was the head of the local Duma, which attempted to initiate self-government and to secure the national equality for Altaians. Tuvan spa Ush-Beldir (Triple confluence), located in a difficult to get to eastern taiga part of the republic, 360 km from Kyzyl, won a Gold Medal in an interregional competition “Gemma-2009”, which just took place in Novosibirsk. Among the best products and services of Siberia, the spa exceeded the famous “Krasnoyarsk Mountains” and “Shira”. “Especially the effectiveness of the healing was evaluated, not the material basis”, Mira Opeyen, the head doctor, explains the sensational success of the Tuvan spa. Despite infrastructural problems, the balneologic spa, which opened in 1933 at the elevation of 1127 meters above sea level, won great popularity by its healing methods and means not only among Siberians. 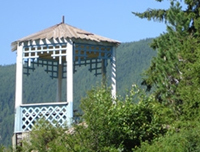 The spa is connected with “Greater Tuva” only by air.